"I first experienced this great soup (the Stilton makes all the difference) on my honeymoon at a little cafe and bookstore near the train station in Edinburgh, Scotland. The day was damp, misty and cool and we were tired from a long train trip from London. I encourage you to enjoy this on a similar day along with some good chunks from a baguette." Separate 3/4 cup of the cauliflower florets and place them in a pan of boiling water. Boil for 2 to 3 minutes, then rinse under cold water, and set aside for garnish. Heat oil in a large saucepan over medium heat. Add onion, garlic, leek and celery. Cook, stirring, until tender, about 5 minutes. Add potato, chicken broth, uncooked cauliflower and sherry. Bring to a boil, then simmer over low heat, stirring occasionally until potatoes and cauliflower are tender. Remove from heat. Puree the cauliflower mixture in batches using a food processor or blender, and transfer to a soup pot over medium-low heat. I like it smooth but still with little tiny bits in it. Season with white pepper, black pepper and salt. Stir in the milk and cream, then crumble in the Stilton cheese. Heat through, but do not boil. Ladle into bowls, and garnish with cauliflower pieces and chopped fresh parsley. 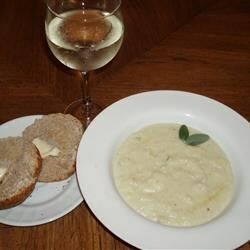 See how to make a creamy cauliflower soup garnished with bacon gremolata. This is an excellent soup for a rainy day. I suggest reserving more cut cauliflower to add to the soup after blending. WOW! This is out of this world!!! My only change to this recipe was to skip the potato for a low(er) carb version. Perfect for these rainy fall days! !